Like in most sectors, when we talk about innovation in the museum world we can’t help but think / talk / do digital. 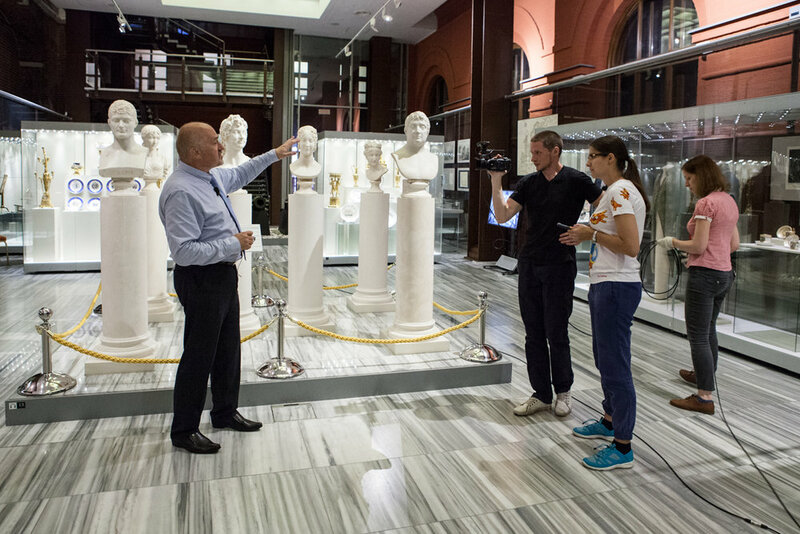 Russia’s cultural institutions are famous worldwide but despite an internet-savvy generation, a professional workforce and a digitally connected capital, digital innovation in the museum sector has been slower than some might want. I spoke with Anna Mikhaylova, an activist who advocates for the improvement of the museum’s position in society and relationship with its audience through digital, shortly before a Museum Club event at the Darwin Museum. This night reflected what Anna does best: bringing together professionals and interested colleagues to discuss new developments and innovation in different parts of museum practice and especially digital innovation. Anna is also founder of the Russian branch of Drinking About Museums (a monthly social learning and networking night) and the creator of Ideas for Museums, an initiative sharing new trends and best practice amongst the Russian museum community. To sum up, she has been prolific in bringing together and inspiring communities of museum professionals. A PhD, lecturer and course organiser, researcher, advocate, consultant, digital innovator, natural collaborator and serial networker, she tells us her story and what we need to know about why digital innovation and collaboration matters for museums. Meet Anna, PhD, Research Associate, Museum Department, Moscow Agency of Leisure and Tourism (SAIC "MOSGORTUR"). We’re here in one of the cafes in Moscow city-center, but I’m what you might call a new citizen in Moscow. I spent my early life in Peterhof, sometimes called the capital of fountains and parks, surrounded by beautiful marvellous architecture with a lot of nature. Now being here in Moscow, it’s a kind of challenge. When I was 14, I started studying as a tour guide, in a project organised by the Peterhof State Museum Reserve. Those who were successful were able to work in the summers as a real guide. Later, in my school we studied different software and how to create websites, and our final task for the year was to create a website. I took my guided tour - which was almost a literary text - and created what we’d now call a virtual tour. I built a virtual tour of the Marly Palace complete with photos, descriptions and directions. At the same time, I was thinking about where to proceed with my higher education. A new department of museum studies and the protection of heritage monuments at the faculty of philosophy at the St Petersburg State University was created. When I checked their website, it wasn’t very clear (the structure, the content) and I decided that if I studied there, I would change the website to make it more user friendly. During the next five years, while studying, I was also responsible for maintaining the website. So, almost from the very beginning, I realised that I want to do both museums and what we call digital. Where did these museum communities grow from? New communities often grow from isolation. This was the case for me - from the beginning I had to create the community that I needed to be part of to be able to grow, learn and share my professional experiences. In 2013, there was not enough space for museum professionals to talk about digital or social media, so I created a group on Facebook where we could discuss issues and new tools in a safe space. Step by step, this community grew. Through this group we organised the first Russian seminar on social media in museums in 2014 at the State Historical Museum. Drinking about Museums is international - we meet once every two months, at a museum or gallery, where we learn something interesting from our peers at a museum before moving our discussions to a local pub or restaurant. I first attended this event in Australia (it’s also held in the US, in London, Paris) and decided we should have this in Russia. The idea is that everyone can join this meeting, no matter how long they have been working in the sector (or even if they are just interested to meet people in the sector). Museum Club involves no food except food for thought - sometimes it’s just informal discussion, sometimes people bring slides. (In the Museum Club event we attended, there were presentations not only from museum professionals but also teenagers who took part in projects.) Ideas for Museums is a website, a name or a title, that informs people about trends and information about the national and worldwide museum sector through newsletters. What are the barriers to digital innovation in museums? Some museums think that if we stream everything online, people won’t come - but if we compare the amount of information on museum websites, for example, with the attendance rate, and we see these two lines - we can see that people keep coming to museums if they stream or if they don’t. Recently, I’ve worked with curators to help them tell stories via live stream from their exhibitions; about how they were made and built, the thought processes involved. Almost every time it was a challenge to explain why online audiences matter. What does digital look like in your life? We once had a very positive experience of a project where a live stream we organised could benefit from an initiative of the Russian Ministry of Culture and the administration of VKontakte and Odnoklassniki, who help cultural organisations with digital traffic. If you stream via social networks, they can show your stream to audiences which are interested in culture, history, music, etc. Once, a live stream on Odnoklassniki was simultaneously watched by 25,000 people. It’s a small amount if you compare it to popular bloggers, of course, but compared to average views of museum content, it’s very big. We streamed at 10.00 in the morning, so evening in the East of Russia. People watched from Vladivostok, from Siberia, and even Russian speaking people from New Zealand. Most of these people wouldn’t be able to come to Moscow for many different reasons, but they spent the whole stream or maybe just several minutes with us, but at least they were able to join and get some emotional response. I believe that a good live stream is not a monologue but a dialogue between those on screen and those who watch - you can see pictures of me working with the team at this event but staring at my phone, not because I’m bored but because I was tracking comments and asking questions on behalf of the public. What do people want from museums? That’s an interesting way to ask the question, because you could ask what role museums want to play as well. Museums still want to educate, and more and more entertain people, and to become spaces not just for the well-prepared regular visitors who want a profound experience, but also for those have to make a choice between, you know, the mall, cinema and museum. So they’re becoming more open. Some museums want to work with local communities - we do see that but I wouldn’t say it’s common practice. I think people want to be more welcomed, for example, families with small children. In St Petersburg, there is a private initiative (in Russian - Мамаход) - mums and young children go somewhere to socialise. They organise tours with guides who can work with these small groups, who won’t be nervous because children, you know, can cry, run around... It wasn’t the museum that proposed something to this audience, but people knew what they wanted and asked the museum. Safe space, adequate tour guide - and they were ready to pay for this. What is the future for the museum sector? I’ve just been reading a report from the American Alliance for Museums where they present a number of scenarios for museums in 2040. They propose one scenario which is very positive and bright - where privacy questions and artificial intelligence work for the common good. Another scenario, which sounds a little like our days, is where society is segregated and there is a huge gap between the wealthy and not wealthy, and where content is monitored and controlled. As buildings and collections, museums have many opportunities to adapt and propose many different things. They can be symbols of power, places for social support and well-being, for community engagement, research and scientific work. How bright this future will be - I can’t say. But they won’t be closed and they won’t be completely replaced by any virtual or digital things. In this report, they even suggest that museums can becomeplaces where we can ‘plug-off’ from the digital world and have real, physical, face-to-face social interactions with objects and with other people. What do you do when you’re not tweeting about museums, meeting other professionals or advising about museum development? I enjoy travelling, especially exploring new places by car, however, usually without checking out the local museums, because during holidays I want to have some freedom. You know when I go to a museum, I start taking pictures, analysing the space, grabbing the leaflets...I have several bags of museum brochures at home, ready to be scanned and uploaded online. This is really valuable data to review and analyse. Besides museums, I also like take care of pets: we have rats and a hamster. We’re working on getting baby rats - I want to spend more time training them because they’re very smart animals. Since my parents and grandmother are in St Petersburg, I try to visit them as often as I can, and I am always happy when we can meet in Moscow.